My upcoming show, "Paper Midrash," includes a series of smaller works I'm calling "From the Genizah" -- named for the traditional Jewish act of burying old and tattered holy books. 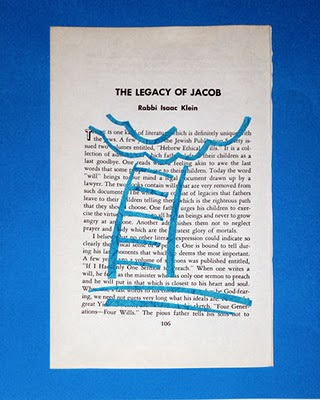 I rescued some books from the "discard" pile at our synagogue and have used them to new purpose in this series. Above you see "The Legacy of Jacob," which takes its title from the page itself and is an interpretation of Jacob's dream. In Bereshit (Genesis) chapter 28 we read, "And he dreamed that there was a ladder set up on the earth, and the top of it reached to heaven; and behold, the angels of God were ascending and descending on it." Note that the word "ascending" comes before "descending" -- what does that tell us about the angels? See this -- and more! -- at "Paper Midrash," at the Merage Jewish Community Center of Orange County from January 24 through February 27, 2010. The opening reception is this Sunday, January 24, from 2 to 5 p.m. I've posted a full catalog of works in the show in PDF format here.